Cube is what Saw could have been, but for the latter's unbridled ego mania. Cube is the distilled essence of the rage against The Man, fed intravenously through the cold veins of a psychopath. Yet, it portrays itself, successfully, as a simple survival quest filled with paranoia, intrigue, double cross and murder. And the movie manages to do all that while being shot in the closed confines of the Cube. The premise of the movie is inventive, and satisfyingly, never fully unravels itself. Six people, completely unrelated to each other, find themselves locked in a mechanical cube, 14 feet across. Soon they realize that there are other cubes next to each other, all inter connected through hatches. Some cubes are safe to enter, others are rigged to kill - instantly. With no way to obtain food or water, the group must navigate the cubes and find a way out, or die of thirst and hunger. But only if they can first come to trust one another. 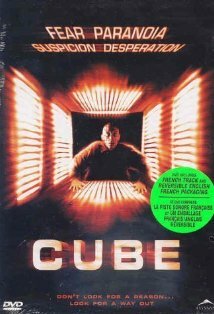 The entire movie is shot within the cube, no background scenes, no cuts to visualize thoughts or feelings. The whole cube farm is supposedly composed of 17,576 cubes, but at any point you see just two cubes - the one the characters are in and the one they are moving into. Yet the movie never feels repetitive. It is the sense of impending doom and struggle for survival that impels the group and the story forward. Yes, there are a few lopped limbs and some razor wire, just enough to grab your attention. Nowhere near the gratuitous self-indulgence of a slasher movie. You could almost call this a sensitive horror movie. Unfortunately the weakest link in the story is the acting. Not by much, but enough to make it stand out. The cast of lesser known actors are a tad over the top at times. Cinematography is adequate. There is a consistent use of wide-angle lenses making the small rooms feel even more claustrophobic. The few special effects are so last decade because, well, the film is from the last decade. And the eerie omnidirectional lighting generates a mood of its own throughout the movie. This movie is part of an upcoming post about movies shot in one location. I had to watch the last few movies before I finished the post. And like the other movies on that list, the lack of spatial flexibility does not hamper the movie. Instead it is actually an asset that helps bind the narrative together. While expansive movies are awesome, there is something about the minimalist genre that is compelling. And Cube is one such compelling watch.